Brush fish fillets with a creamy homemade herbed sauce in this broiled cod recipe. When done, drizzle this Herb & Garlic Broiled Cod with lemon juice! Mix dressing and seasonings until blended. Place fish on rack of broiler pan sprayed with cooking spray; brush with dressing mixture. Broil, 4 inches from heat, 6 to 8 min. or until fish flakes easily with fork. Drizzle with lemon juice. Prepare using MIRACLE WHIP LIGHT Dressing, and sprinkling coated fish with 1 to 2 Tbsp. Italian-style bread crumbs before broiling as directed. 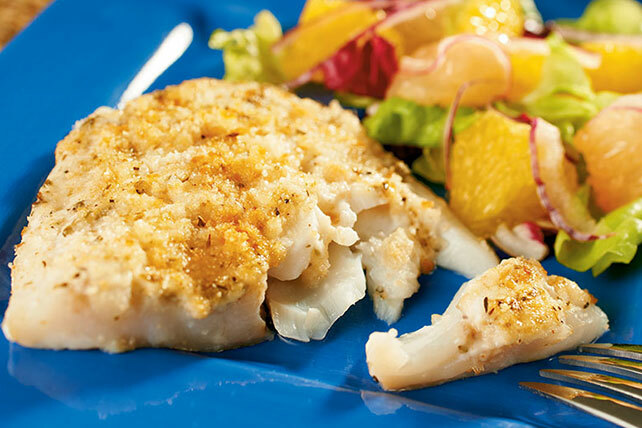 Prepare using orange roughy fillets.